Click the button below to add the Advantage White Poly Folding Chair - Oversized With Gray Frame [DAD-YCD-70-WH-GG] to your wish list. If you are searching for extra-comfortable white folding chairs to provide your guests a bit more seating room, these oversized white folding chairs with comfortably contoured seats and backs may be just what you're looking for! Your wedding, banquet or event guests will be able to enjoy comfortable seating for long periods with this particular line of poly folding chairs, due to the added seat & back with, along with the gently contoured lines for more comfortable seat shape. The "waterfall" style leading edge of the folding chair seat means that your guests will enjoy better circulation and greater comfort when seated. The sturdy 1-inch round, 18 gauge steel frames with welded steel crossbars in both the front and back provide long term durability at a discount folding chair price. These economical, durable, black foldable chairs are perfect as folding wedding chairs, folding banquet chairs, or any event or facility foldable seating purpose where a lighter weight foldable chair is desired for ease of transport, storage, and setup and takedown. Your guests will appreciate the added seating space, too! Which states qualify for free shipping? All 48 contiguous states of the United States qualify for free shipping for 50+ folding chairs (excluding New York City and island cities throughout the US). What are the shipping charges for less than 50 chairs? Most areas feature a base shipping rate of $125 for orders of less than 50 chairs. Lift Gate Service / Residential Deliveries : Shipments to commercial addresses without access to a commercial truck level loading dock or forklift require lift gate service at an additional fee of $50 per shipment. This service will allow pallets to be lowered to ground level for you (certain restrictions apply for over-sized products). Residential deliveries are an additional $125 above the normal shipping rates and include lift gate service for easy unloading. 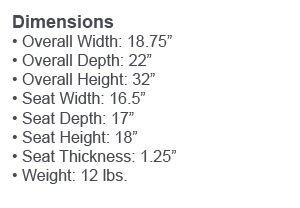 Orders of smaller quantities of folding chairs that qualify for standard ground shipping may ship at a lower rate. Details can be discussed with our sales team at: (866) 404-7671.